The first official images of the new BMW 4 Series have been revealed ahead of the car's launch this October. It's a stylish coupe that's true to the concept car originally shown in December 2012. The rear-wheel drive, four-seater coupe combines the concept's overall design, with more production-friendly details first seen in the 3 Series saloon. 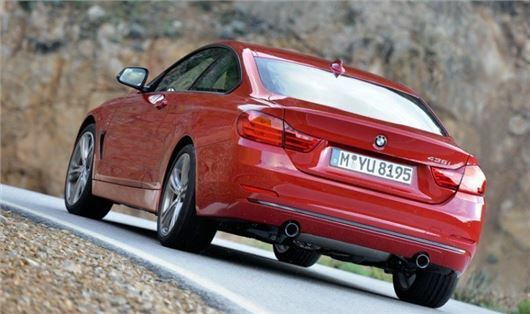 Prices will start at £31,575 for the 420d. The styling of what is undoubtedly going to be 2014's darling of the overtaking lane is conventionally handsome, taking the long nose/short rump proportions of the saloon and exaggerating them further. Gone are the concept's chrome-rimmed air intakes, gaping hole in the nose and gorgeous LED front lamps - in their place are more familiar - tamer - fittings. The styling of 2014's darling of the overtaking lane is conventionally handsome, taking the long nose/short rump proportions of the saloon and exaggerating them. The all-turbo engine range will be narrower than the 3 Series, accentuating the 4 Series' loftier pricing and market positioning. The entry-level model will be the £31,575 420d, and the initial engine range will look like this: 185PS four-cylinder turbodiesel; a 245PS 2.0-litre four-cylinder petrol; and a 306PS 3.0-litre six-cylinder petrol in the initial range-topping £40,795 435i. They will quickly be followed by the 184PS 2.0-litre four-cylinder petrol, 260PS 3.0-litre six-cylinder diesel; and a 313PS version of that unit in the 435d. Five trim levels - SE, Sport, Modern, Luxury and M Sport - will be offered. The range-topping 435d be fitted with xDrive all-wheel drive as standard, making this one very capable all-rounder. Claimed 0-62mph time is 5.1 seconds, but combined fuel consumption will be 61.4mpg with CO2 emissions of 121g/km. Equipment levels have been increased, and the interior is roomier than the outgoing 3 Series Coupe. The lengthened wheelbase means more rear legroom, and the boot capacity is up by five litres to 445 litres. Standard equipment on all models includes 6.5-inch infoitainment screen with iDrive, and 18-inch alloys and sports seats are fitted to all models except the entry-level SE. Spectacular! Looking forward to seeing one of these in the flesh.